Lovingly Compiled by Allison Hazell (Lissa)With all of the wonderful memories of family holidays, celebrations and meals that went with them, I decided t0 gather up all of the great dishes that I have found and some that I've created over time. When it was time to eat we heard my Mom, Aunt Marg or Gramma Miggie say "Sit down and eat!" I tried to choose easy, interesting and tasty dishes. I wanted to share these meals with my family and friends who love to eat (and cook)! 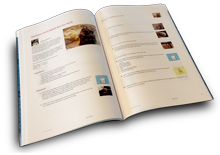 Order a professionally printed, perfect bound cookbook with a full color glossy cover and 42 recipes. Allison, thank you for including one of my recipes in your cookbook! Allison, your intro to the book just touched my heart.. because that's exactly how I feel when I cook or bake, alway's!! I am truly humbled and honored to be included, especially a very, very old family heritage one!! What a great idea for a cookbook. Thanks for including my recipe. I think some of these recipes are simply wonderful family food. I'm going to enjoy making a number of these. Thank you Jan! It is just so much fun sharing these recipes and being able to produce something like this just for fun. Your series is a great idea, Allison. And JustAPinch is a gold mine when you go digging for treasures to put into books like that. There are SO many old family recipes here. No,thank you ladies! Your recipes are awesome. I've started a "series" (hee hee) of cookbooks from this site...Starters, Sit down and eat (entrees) and am almost finished on the veggie/side dish book, "You can't play until you eat your vegetables". (ha)..all based on my childhood memories of family meals and holidays. I included (very) old family pictures on the cover to intice my family and friends to try the great recipes I found from people like you on JAP...thanks so very much. I'm honored to have my recipe in your cookbook, Allison. Thank you. This is one of our favorite dishes. In fact, I just had some for supper! I'll enjoy browsing to see what the other recipes are.